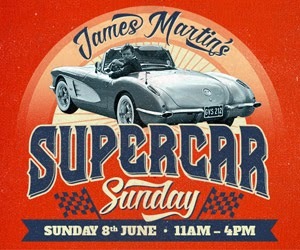 When I found out about this event in the centre of Manchester and that renowned celebrity chef and all round petrol head James Martin was hosting it, I knew the cars would be awesome and I wasn’t disappointed. There may not have been a ton of cars there but the quality was all that was needed to make a fantastic event. Located in Great Northern Square just round the corner from his Manchester restaurant and with the sun shining it was the perfect space to show off the cars. With at least two from James’s own garage (his name on the side of both of then help give it away) a race prep’d Ferrari and a fantastic two tone Ford Prefect. Add in to the mix a few more Ferrari’s such as a Daytona, Dino and the super wide 80’s icon the Testarossa, this one really took your breath away. A few Bentley’s and an immensely huge Rolls Royce Wraith. Oh and not forgetting the Khan Land and Range Rovers, Maserati Grand Tourismo an Alfa Romeo 1750 GTV and Eleanor. But the car drawing the crowds and parked right in the middle and un-missable in its bright orange paint work was the McLaren 650S Spider which was just stunning. It’s a car that oozes power and performance and the styling details all over it means there’s not a single angle that’s not photographic. I’ll definitely be making my way over to this event if it’s on again.